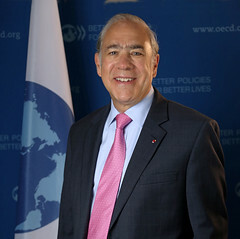 As Secretary-General of the Organisation of Economic Co-operation and Development (OECD) since 2006, Angel Gurría has firmly established the Organisation as a pillar of the global economic governance architecture including the G7, G20 and APEC, and a reference point in the design and implementation of better policies for better lives. He has broadened OECD’s membership with the accession of Chile, Estonia, Israel, Latvia and Slovenia, and has made the Organisation more inclusive by strengthening its links with key emerging economies. Under his watch, the OECD is leading the effort to reform the international tax system, and to improve governance frameworks in anti-corruption and other fields. He has also heralded a new growth narrative that promotes the well-being of people, including women, gender and youth, and has scaled up the OECD contribution to the global agenda, including the Paris Agreement on Climate Change and the adoption of the Sustainable Development Goals. Born on May 8th, 1950, in Tampico, Mexico, Mr. Gurría came to the OECD following a distinguished career in public service in his country, including positions as Minister of Foreign Affairs and Minister of Finance and Public Credit in the 1990s. For the first time in a generation, he steered Mexico’s economy through a change of Administration without a recurrence of the financial crises that had previously dogged such changes. Mr. Gurría holds a B.A. degree in Economics from UNAM (Mexico) and a M.A. degree in Economics from Leeds University (United Kingdom). He has received Honorary Degrees from the Universidad de Valle de México, Rey Juan Carlos University, European University of Madrid, and the Universities of Leeds, Haifa and Bratislava. A regular contributor to some of the world’s leading newspapers and journals, Mr. Gurría has received several awards and decorations from more than 30 countries, including the titles of Grand officier de la Légion d’honneur and Chevalier dans l’ordre du Mérite agricole, awarded by the French Government. He has also received a Medal from the French Senate and the Ridder Grootkruis in de Orde van Oranje-Naussau awarded by the Netherlands. Most recently, he was distinguished by the President of Korea with the Gwangwha Medal for Diplomatic Service, and also received recognition to his longstanding contribution to the development of public administration in Mexico, the Medalla al Mérito Administrativo Internacional “Gustavo Martínez Cabañas”, awarded by the Instituto Nacional de Administración Pública (INAP). In 2007, Mr. Gurría was the first recipient of the Globalist of the Year Award of the Canadian International Council to honour his efforts as a global citizen to promote trans-nationalism, inclusiveness and a global consciousness. His awards include the Ben Gurion Leadership Award, the Award Isidro Fabela by the Mexican Association of International Studies, the Nueva Economía Award, the Orden Bernardo O’Higgins en el Grado de Gran Cruz, and the Medalla Rectoral from the University of Chile. Mr. Gurría has participated in various international not-for-profit bodies, including the Population Council, based in New York, and the Center for Global Development based in Washington. He chaired the International Task Force on Financing Water for All and continues to be deeply involved in water issues, being a member of the United Nations Secretary General Advisory Board for Water and Sanitation (UNSGAB) and of the World Economic Forum’s Global Agenda Council on Water Security. He is also a member of the International Advisory Board of Governors of the Centre for International Governance Innovation; based in Canada, the Advisory Board for the Global Green Growth Forum (3GF), co-hosted by Korea and Denmark, and the Advisory Board to the International Forum on Genomics, Innovation and Economic Growth, and was recently appointed as a member of the Royal Academy of Economic and Financial Sciences of Spain.